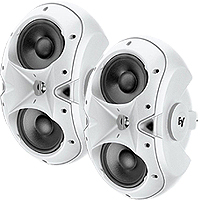 Perfect for a variety of environments where full-range audio is needed but space is limited: restaurants, bars, bistros, department stores, and outdoor venues. If you're purchasing several or designing a custom set-up, send us an e-mail for a custom quote. The EVID 3.2 produces sound that defies its small size. It is loaded with dual, 3.5-inch, low-frequency drivers and a .75-inch, Ti-direct radiator. 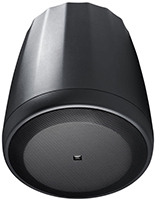 Its unobtrusive profile is ideal for background music and paging support in a variety of environments such as offices, retail stores, and restaurants. 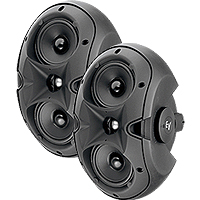 Perfect for a variety of environments where full-range audio is needed but space is limited: restaurants, bars, bistros, department stores, and out door venues. 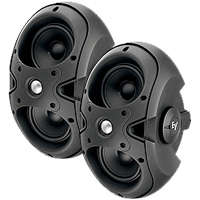 Offering the bass response of a much larger speaker, dual 4-inch woofers make the 4.2 a phenomenal performer. 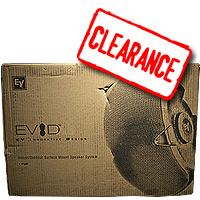 The EVID 6.2 is an extended-range loudspeaker ideal for indoor and outdoor applications requiring high-quality sound. 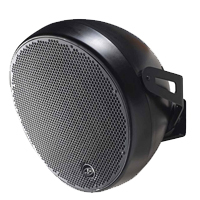 Its extended range and smooth bass provide ample SPL levels in larger environments such as shopping malls, sports bars, health clubs, and so on. 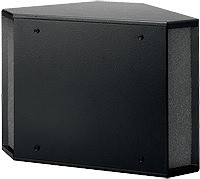 The ElectroVoice EVID 12.1 is a passive, surface-mount installation subwoofer featuring a 12" driver, dual voice coils that process both channels of stereo low end information, a 175-Watt per coil power reservoir, and a 160Hz passive crossover. The Ovi 12 is a unique and versatile loudspeaker system.